The community housing landscape is shifting as we move towards modernization, and we are being challenged with how to use and develop our skill sets to successfully navigate all of the changes. Recently, ONPHA engaged in a research project to explore what competencies would be needed in this new era of change and modernization in Ontario. The focus was on what non-profit housing organizations need overall to ensure their successful operations. 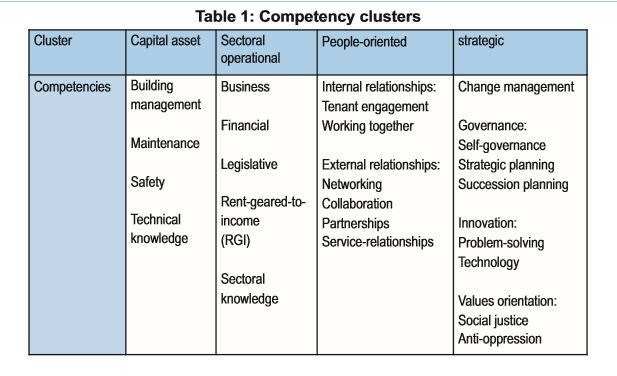 To start, we defined competencies as “the knowledge, skills, abilities, and value orientation applied through principled actions and professional behaviour to ensure housing excellence for low- and medium-income tenants”. An international literature review was carried out to explore the competencies required for current —and future— housing excellence. This was followed by a survey, a focus group with ONPHA’s Local Advisory Members (LAMs) and eight interviews with ONPHA members. It will come as no surprise that adaptability, strategy and innovation were identified by survey participants as more necessary as we move into the future. And, respondents indicated that social inclusion is also needed. This balance of social mission and business strategy is something that members negotiate every day. An organizational competency-based approach provides a way of thinking about, planning for the recruitment of and educating the next generation of staff and board members.